Randall came to The Buyer’s Agent after two decades of serving in Asheville’s planning department of HUD (Housing and Urban Development). He joined the agency in 2002. He is eminently qualified to help clients purchase homes. He has a BS in Community Planning from Appalachian State University. He earned his broker’s license in 2004, Accredited Buyers Representative (ACR) in 2004, ECO Realtor in 2009, and Workforce Housing Specialist in 2010. A native of Boone, NC, Randall loves all outdoor activities, especially mountain biking, hiking, skiing, camping and tour cycling. He is an active member of his church and a Sunday school teacher. He also volunteers with Boy Scouts and Special Olympics. These activities helped him earn the National Association of Realtors Good Neighbor Award in 2007 for volunteering endeavors commended by the real estate community. Married for nearly three decades, he and his wife have two children, but a large extended family, as they have hosted numerous international exchange students. The family enjoys canoeing the French Broad River and biking Bent Creek’s trails. Working with Randall was a breeze! There are so many very important things to consider as you’re shopping for your new or first home. 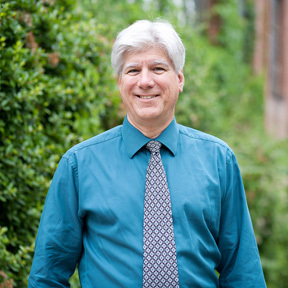 Randall had the experience as a buyer’s agent, the insight into the negotiation process and the knowledge of the Asheville market to help us purchase not only a house we could afford but a home we love! Even though he wasn’t going to get the huge commission that a million-dollar sale would give him, Randall still gave us the million-dollar treatment. He took us to as little or as many houses we wanted, both evenings and weekends in order to fit around our busy schedules. Not only did he go out of his way to make our experience as stress-free as possible, but he never treated us like second-rate clients. He always answered any of our questions, often before we could ask them, and we never felt rushed into a sale or even a contract. He was able to save us more money than we ever expected and get us into a neighborhood we NEVER thought we could afford. Randall supported us completely, and for that we are very grateful. Randall Barnett’s experience, knowledge and expertise were invaluable in the purchase of my home. He was easy to work with and always accessible. The Buyer’s Agent of Asheville and Mr. Barnett gave order to the chaotic process of buying a home.